The month of September is dedicated to Our Lady of Sorrows / the 7 Sorrows of Mary. Jesus Himself was Mary's sorrow, seven times repeated. During the hours of the Passion, the offering of Jesus and the offering of Mary were tied in one. They kept pace together; they were made of the same materials; they were perfumed with kindred fragrance; they were lighted with the same fire; they were offered with kindred dispositions. The two things were one simultaneous oblation, interwoven each moment through the thickly crowded mysteries of that dread time, unto the eternal Father, out of two sinless hearts, that were the hearts of Son and Mother, for the sins of a guilty world which fell on them contrary to their merits, but according to their own free will. 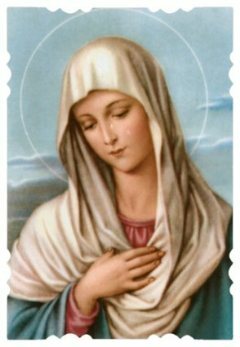 The Blessed Virgin Mary grants 7 graces to the souls who honor her daily by saying 7 Hail Mary's and meditating on her tears & sorrows. 3. I will console them in their pains & I will accompany them in their work. 5. I will defend them in their spiritual battles with the infernal enemy & I will protect them at every instant of their lives. 6. I will visibly help them at the moment of their death, they will see the face of their Mother. 7. I have obtained from my divine Son, that those who propagate this devotion to my tears and sorrows, will be taken directly from this earthly life to eternal happiness since all their sins will be forgiven & my Son and I will be their eternal consolation and joy. 1.The prophecy of Simeon. (St. Luke 2: 34, 35). 2.The flight into Egypt. (St. Matthew 2:13-14). 3.The loss of the Child Jesus in the temple. (St. Luke 2: 43-45). 4.The meeting of Jesus and Mary on the Way of the Cross. 6.The taking down of the Body of Jesus from the Cross.